The Lenovo ThinkPad Yoga 11e can't match the performance that you'll get from pricier midrange convertible-hybrid laptops, and it's almost twice the price of the similarly configured, entry-level Dell Inspiron 11 3000 Series 2-in-1. However, if you need a laptop that can stand up to the bumps and bruises of classroom use and life on the road, it'll fit the bill. Although its IPS touch screen is responsive and delivers rich colors, it's a relatively low-resolution display for an $800 system. If you want more bang for your buck and aren't overly concerned with ruggedness, check out our Editors' Choice midrange convertible-hybrid laptop, the HP Spectre x360 13t (13-4003). 70% Is a flexible, durable Chromebook worth almost 500 bucks? While expensive, the Lenovo ThinkPad Yoga 11e Chromebook makes up for its relatively steep price with excellent, classroom-friendly features. Lenovo offers a truly rugged design, a flip screen that rotates a full 360 degrees, an excellent keyboard and touchpad, a bright and vivid touch screen and surprisingly good speakers. 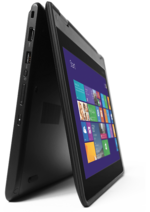 The Lenovo ThinkPad Yoga 11e Chromebook is an interesting alternative to a traditional, expensive business notebook. It nails down most of the basics. The 11e features a rugged design, great keyboard, and a decent display with wide viewing angles. Whether Chrome OS can serve as an alternative to Windows is questionable. Finally, while the ThinkPad Yoga 11e Chromebook is heavy compared with other Chromebooks, the extra bumpers are ideal for elementary school children. While middle school and high school students tend to be more careful with technology and won’t appreciate the extra weight that comes from adding more ruggedness to the design, a little extra protection goes a long way. That said, if older students carry this device plus their textbooks, the ThinkPad Yoga 11e would turn their backpack into a heavyweight. The idea of giving Chromebooks to students makes a lot of sense, whether the system is being provided by the school or gifted by the parents, because Google's OS is easy to use, extremely secure and nearly impossible to infect with malware. The Lenovo ThinkPad Yoga 11e Chromebook stands out as a particularly strong choice for kids because of its durable design and springy keyboard. Lenovo's Yoga 11e is unique among Chromebooks, combining a touchscreen, rugged body, and hybrid hinge design. For students and teachers, it may be exactly what they're looking for, and also makes a compelling case for cloud-heavy use on the road -- if that road involves a lot of bumps and bashes. As far as Chromebooks go, the ThinkPad Yoga 11e stands out from the crowd for a couple different reasons: the design and the convertible construction. Unlike some competing models, the Yoga 11e doesn't look like a toy, and it has the distinct Lenovo feel that fans will be familiar with. The ability to fold the display back completely into a tablet mode is a big plus. But is it worth $479? For school districts, buying in bulk and saving thousands by deploying Chromebooks instead of Windows laptops, sure. For individuals, the price tag is more daunting, but the 11e deserves to be on your short list anyway. To put it another way, we're not complaining that it costs more than $199, but if Lenovo could somehow cut it to $399, this would be a five-star review. Lenovo's ThinkPad Yoga 11e Chromebook costs more than any of the entry-level systems, but remember: It isn't meant to be an entry-level system. You get what you pay for -- and if you've got the cash to spend on a midrange Chrome OS device, the Yoga 11e will give you an awesome overall experience that's a meaningful notch above the rest.